Richard Garrett, a doctoral student in ISE, was awarded a Department of Homeland Security (DHS) Fellowship via the Command, Control, and Interoperability Center for Advanced Data Analysis (CCICADA) at Rutgers University. As a DHS Fellow, Richard will receive research support from DHS and tuition from RPI for up to three years in order to pursue research interests that are applicable to decision making and data analysis for homeland security. Recipients are offered exposure to a broad spectrum of interdisciplinary research and education programs such as natural disaster preparedness and response, resource planning and allocation, cybersecurity, and nuclear threat detection. CCICADA is a DHS Center of Excellence focusing on algorithmic methods for challenging problems in data analysis that address present and merging homeland security threats. 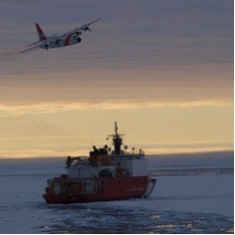 Richard’s research is on providing decision support for optimizing oil spill response resource allocation in the Alaskan Arctic in partnership with the United States Coast Guard. Richard is conducting this research with his advisors, Professors Thomas Sharkey, William A. Wallace, and Martha Grabowski.